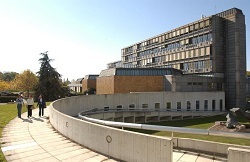 HEC Lausanne, also called the Faculty of Business and Economics of the University of Lausanne, is the affiliated business school of the University of Lausanne. Since 1911, HEC Lausanne has been developing teaching and research in the field of business and economics. HEC Lausanne offers Bachelor, Master, and PhD degrees, as well as executive education, including a part-time Executive MBA, and tailor-made programs for organizations. In addition, HEC Lausanne has a strong international presence with more than 130 partner schools around the world.